While many reacted with joy to the news of Xbox 360 games becoming backwards compatible on Xbox One, there was one snag: many of said games were out of print and difficult to find, particularly if you were looking for an unused copy. Microsoft appears to be rectifying that problem, at least according to one Reddit thread. 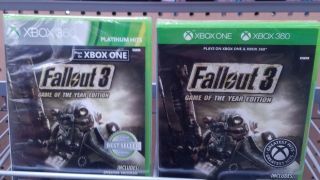 User divangreedy8 shared two images from a recent shopping trip, showing both Doom 3: BFG Edition and Fallout 3: Game of the Year Edition resting comfortably in new packaging. These new boxes are the smaller, greener style seen used for Xbox One games, but with both "Xbox One" and "Xbox 360" printed across the top. Both of the games divangreedy8 shared are published by Bethesda, so it's not clear if this is Microsoft's doing or Bethesda's. Personally, I hope it's a wide-ranging initiative. It would be great if, while browsing the gaming section of your favorite retail store, you could easily tell which Xbox 360 games will work on your Xbox One. Whoever's responsible, I give kudos - this is pretty clever, especially as we head into the holiday season and plenty of shoppers will be searching for cheap games to fill out their gift baskets.